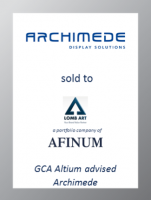 GCA Altium acted as exclusive financial advisor to the shareholder of Archimede, a leading Italian player in the design and production of exhibition and advertising solutions, on the sale of its majority stake to Lomb Art, a portfolio company of AFINUM Management. Archimede is a leading Italian manufacturer of exhibition and advertising products, providing a wide range of tailor-made solutions such as counter displays, window displays, banners and plaques to top tier Italian and international customers operating in different industries such as eyewear, retail and jewelry. Archimede has demonstrated strong growth, delivering sales and EBITDA CAGR above industry average over the last three years, leveraging its comprehensive products portfolio and long term relationship with key customers. By acquiring the majority stake of Archimede, Lomb Art, a Swiss manufacturer of point-of-purchase displays and distributor of packaging products mainly for the watch and jewelry industries, will further strengthen its leading position worldwide. Daniel Bortolamei, Archimede’s shareholder, said: "I am delighted that Archimede is now part of Lomb Art Group. I am convinced that this deal will generate strong synergies and growth opportunities." “Alessandro Soprano, Managing Director of GCA Altium, led an international sale process demonstrating the strong global reach of GCA Altium and their effectiveness in managing complex transactions,” said Daniel Bortolamei. This deal underlines GCA Altium's strong position in the Industrials sector, having completed 17 transactions within the last two years.